Appeared in court in February 1850 for trespassing in pursuit of game when he was sentenced to two months in prison. 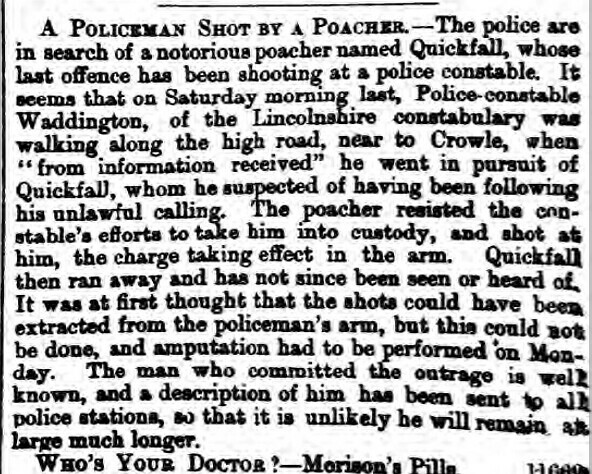 10 June 1866 spotted by two policemen emerging from a wood and carrying a gun. 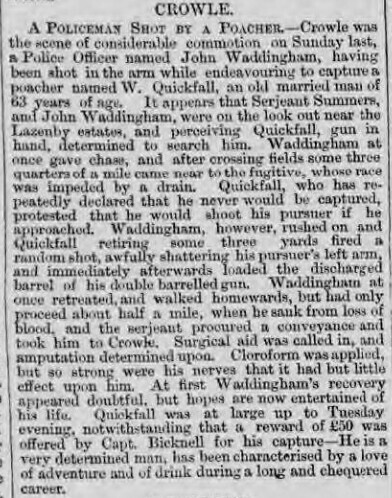 The two policemen Constable Waddingham and Acting Sergeant Summers gave chase. Despite being 63 it was 3/4 of a mile before the policemen caught up when Quickfall encountered a drain. He turned and threatened the officers that he would shoot rather than be taken. Waddingham approached and Quickfall fired injuring Waddingham below the shoulder (his arm was subsequently amputated). Quickfall escaped and survived for several days before going to his brother-in-laws house when he was handed into the police. Acting Sergeant Summers was dismissed from the Constabulary for Cowardice. He was tried at Lincoln assizes for attempted murder but found guilty of causing grievous bodily harm.and sentenced to five years penal servitude. He served his time at Dartmoor Prison and was released on license July 1970.